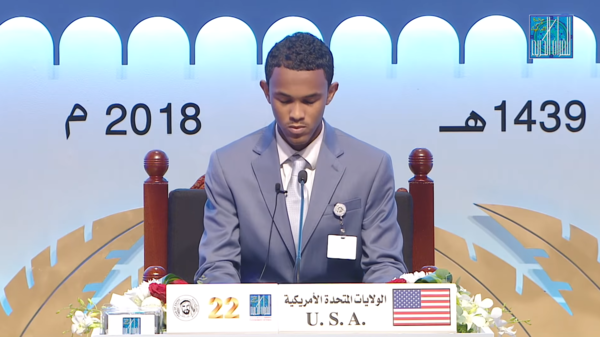 Seventeen-year-old Ahmed Burhan Mohamed has earned the title of hafiz — someone who has not only learned to read the Quran, but memorized it. AHMED BURHAN MOHAMED: (Speaking Arabic). That's Ahmed Burhan Mohamed's award-winning recitation of the Quran, the holy book of Islam. He wowed judges with a nearly perfect oration of the scripture and took home the Dubai International Holy Quran Award in the United Arab Emirates. He's the first American to win the prestigious competition. He's also of Somali descent. MOHAMED: Oh, I was very proud. It was like a dream come true. I didn't even - five years before that, I didn't even think of myself going to that competition. I was very surprised. GARCIA-NAVARRO: Many Muslim children learn how to read the Quran at some point in their life, but Ahmed is a hafiz, someone who has not only learned to read the Quran but memorized it - a huge feat for any 17-year-old. MOHAMED: At first you don't actually want to learn it because you're a little kid who wants to play around most of the times. As you learn more and more, and as you become more mature, you become used to it, and you - it becomes a big part of your life. GARCIA-NAVARRO: So what does it take to memorize an over-1400-year-old scripture? MOHAMED: Every single time I got, like, free time, I would be reading the Quran - maybe on the bus, maybe at school, sometimes when I have, like, free periods. So it was very intense. You have to sacrifice a lot of time and put a lot of time into it. You can't be acting like most kids. You have to put more time into the book than you put into, like, other fun stuff. GARCIA-NAVARRO: Less time for video games and basketball. Ahmed says his whole purpose is to carry out the message of the book. MOHAMED: So basically, I did all this - my motivation was memorizing my god's holy book and our god's holy book so I can implement it. GARCIA-NAVARRO: And his favorite chapter, or surah, of the Quran to recite? Surah Rahman. He loves the rhythm and repetition, but he also loves the meaning, which is about giving back. Transcript provided by NPR, Copyright NPR.